- Publisher Essential Grammar in Use is a grammar reference and practice book for elementary learners. Modelled on Raymond Murphy's successful intermediate-level English Grammar in Use, it concentrates on areas of grammar normally taught at elementary level. - Easy to use: on each left-hand page a grammar point is explained and on the facing pages there are exercises to check understanding. - Clear explanations: grammar for elementary learners is explained in simple language. - Accessible: the clear contents list and index of grammatical items make it easy for learners to select the units they need. - Additional exercises: these offer extra practice of key grammar points. - Appendices: these references deal with tenses, irregular verbs, short forms, spelling and phrasal verbs. - Self-study: the book can be used by learners working independently. - Key: this contains the answers to all the exercises. About "Essential Grammar in Use (2nd Edition)"
Essential Grammar in Use is a grammar reference and practice book for elementary learners. 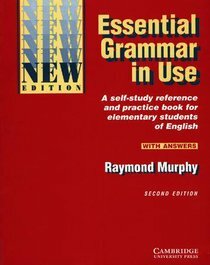 Modelled on Raymond Murphy's successful intermediate-level English Grammar in Use, it concentrates on areas of grammar normally taught at elementary level. - Easy to use: on each left-hand page a grammar point is explained and on the facing pages there are exercises to check understanding. - Clear explanations: grammar for elementary learners is explained in simple language. - Accessible: the clear contents list and index of grammatical items make it easy for learners to select the units they need. - Additional exercises: these offer extra practice of key grammar points. - Appendices: these references deal with tenses, irregular verbs, short forms, spelling and phrasal verbs. - Self-study: the book can be used by learners working independently. - Key: this contains the answers to all the exercises. Murphy received his doctorate in theology at the Catholic University of America, and was professor there, first in Semitic Language and then in Old Testament. Since 1971 he has been at the Duke University Divinity School, where he is George Washington Ivey Professor of Biblical Studies. 39 I Am/i Don't Etc. 41 Too/either, So Am I/neither Do I Etc. 46 What ? Which ? How ? 47 How Long Does It Take ? 48 Do You Know Where ? I Don't Know What Etc. 63 -s (ann's Camera/my Brother's Car) Etc.